Professor White uses X-ray satellite observatories to study the hot atmospheres of elliptical galaxies and clusters of galaxies. He uses X-ray spectroscopy to determine the gas temperatures and chemical abundances in these atmospheres, in order to help determine how galaxies and clusters evolve. More specifically, Prof. White uses X-ray observations to constrain theoretical models of supernovae (exploding stars), which enrich these atmospheres with elements such as oxygen, silicon, and iron. Professor White also uses X-ray observations to investigate the origin and energetics of high-redshift Lyman-alpha-emitting clouds, in collaboration with Professor Keel. Professor White collaborated with Professor Keel in a very different research direction: using partially overlapping pairs of galaxies to determine whether spiral galaxies are largely opaque or transparent to light. The non-overlapping parts of the background galaxy can be used to reconstruct how much of its light is lost from the overlapping parts as it passes through the foreground galaxy. They used this technique to construct detailed maps of the dust (which blocks light) in several spiral galaxies. Professor White received his doctoral degree from the University of Virgina in 1986. 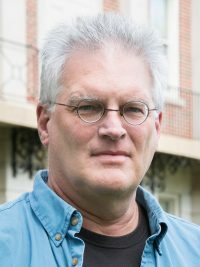 He joined the faculty of The University of Alabama in 1988.